The Museum of Ice Cream turns out to have one cleanup duty they need to tend to, and neighbors are starting to notice. An SFist tipster sent in the photos below decrying the "pollution" being created as countless tiny, presumably non-biodegradable plastic sprinkles from the MoIC's signature Sprinkle Pool can be seen littering the sidewalk and gutters outside the museum at Kearny and Market, and heading into a storm drain where, fingers crossed, they won't end up in the ocean. Reader Chris W., an office-neighbor of the MoIC, says he's found the sprinkles upwards of three and four blocks away, and "Despite complaining to MOIC security and customer service about this ongoing problem in the neighborhood there has been no progress." 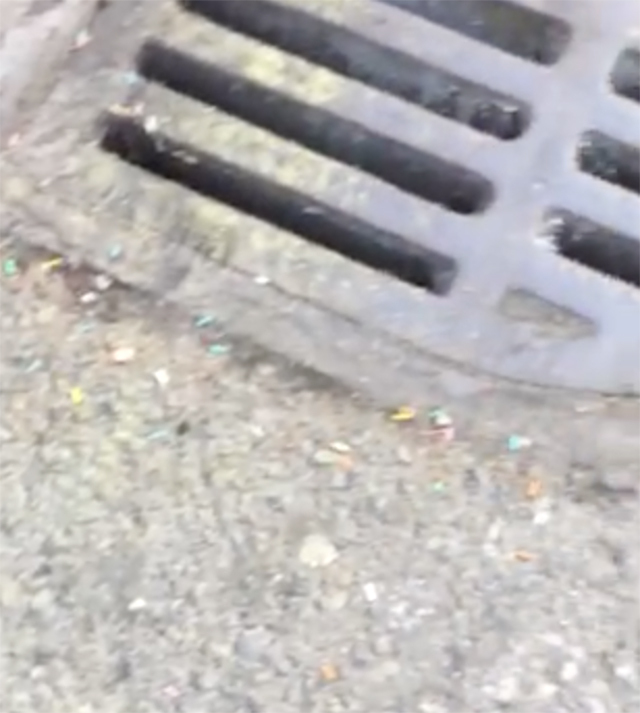 I personally observed the sprinkles yesterday dotting the entire block of sidewalk on Stockton Street between O'Farrell and Geary (see photo above), well over a block away from the MoIC, meaning that Chris W. was not sounding false alarms, and the spread of these colorful bits of refuse are in fact already making their way around the neighborhood. 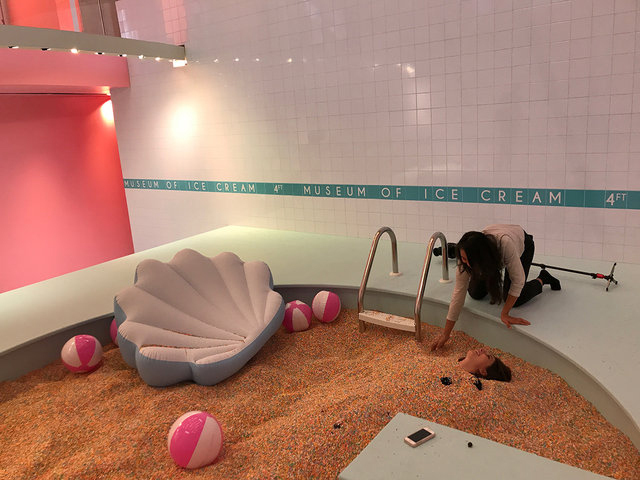 Inside the museum, guests are invited to take a "dip" in the whimsical sprinkle pool, after removing their shoes, and then you can go in a "Sprinkle Shower" in which an employee or a friend will use a compressed-air hose to blow any errant sprinkles off of your clothing. I can attest from my own experience dipping in the Sprinkle Pool a month ago that I continued to find the tiny sprinkles in my pockets, pant cuffs, socks, and underwear for days thereafter, and they ended up on the floor of my bedroom as a result, where I am still finding them. 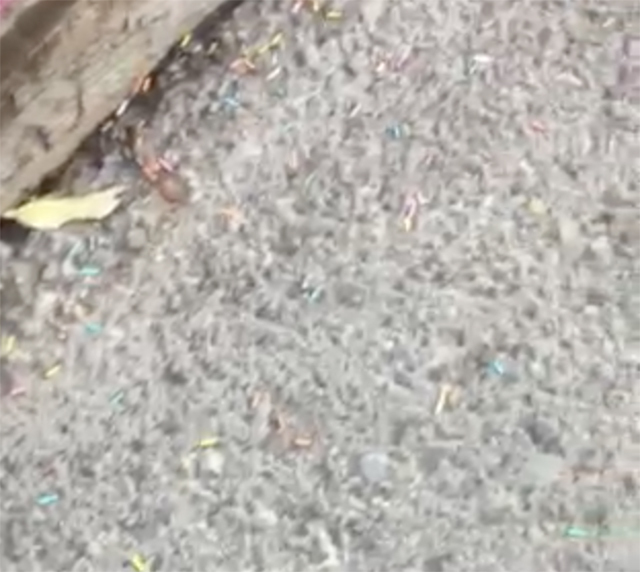 Eater LA noticed the sprinkle-litter problem last month, long after the iteration of the MoIC opened there, with the Arts District in LA apparently covered in the things for months. The MoIC response at the time was, "Our employees tell everyone repeatedly to shake off and make sure they get rid of all the extra sprinkles. 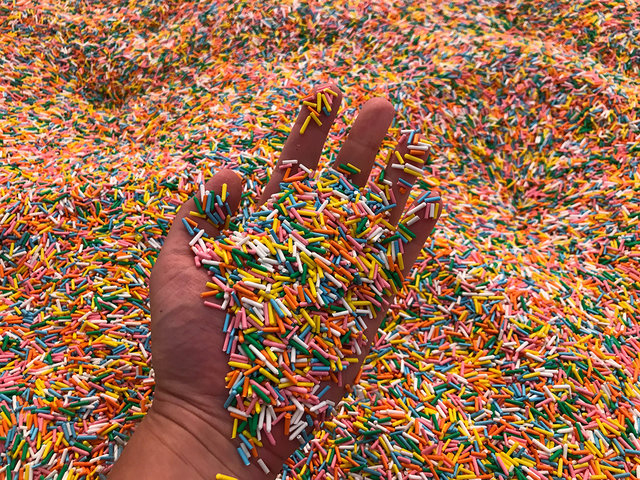 Before leaving the Museum of Ice Cream, our team members are told to double check guests to make sure everyone has shaken off excess sprinkles." So, yes, this cleanup is going to be a challenge! And an ongoing one. The Museum of Ice Cream is continuing its sold-out run in San Francisco through February, at least, pending further extensions.